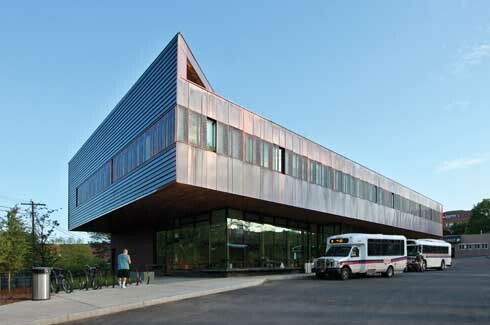 The John W. Olver Transit Center at Greenfield, Massachusetts, is the torch-bearer of the zero-net energy federal buildings’ revolution in the US. The non-flamboyant façade of the building doesn’t give away much about the fantastic achievement that the Center stands for – it is the first zero-net energy transit hub of the United States. In 2009, the Barack Obama administration passed Executive Order 13514, titled ‘Federal Leadership in Environmental, Energy, and Economic Performance’, which necessitates that every American federal building be zero-net energy by the year 2030. 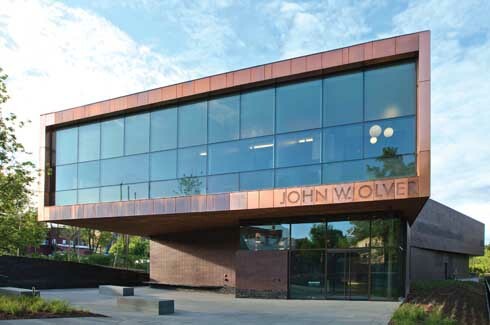 The John W. Olver Transit Center was completed in 2012, at Greenfield, Massachusetts, with precisely this grand vision in mind. 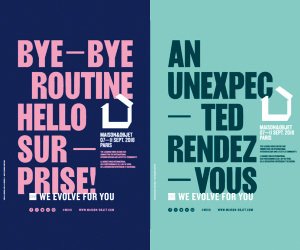 metamorphosing it into electrical energy. It was commissioned by the Federal Transit Commission, and funded under the aegis of the American Recovery and Re-investment Act (ARRA), with the function of being a facilitator of composite transit services, including local and inter-city bus, passenger train, and more. The non-flamboyant façade of the building doesn’t give away much about the fantastic achievement that the center stands for – it is the first zero-net energy transit hub of the United States. 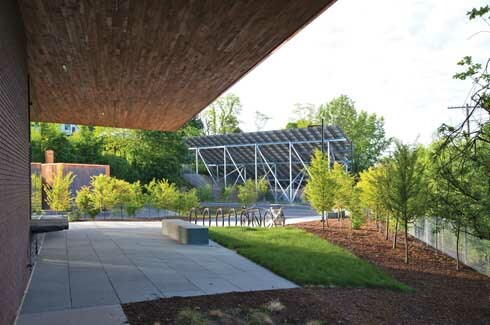 Massachusetts-based Charles Rose Architects conceptualised a structure that not just comes up and trumps on the sustainability charts, but is also sensitive to Greenfield’s history, present concerns, and its future expectations. “Our design bends the building toward the northern end, which gives it a sense of motion, or perhaps a current running through the structure,” states the team. 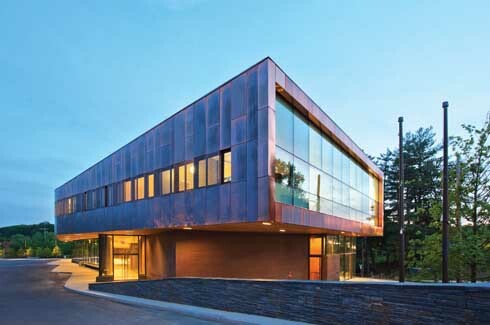 Green architectural considerations naturally influenced the building materials used in this project. The team went for an expansive mix that embraced brick, bronze, copper, concrete, steel and stainless steel, walnut wood, plaster, bluestone, and elements of terrazzo. 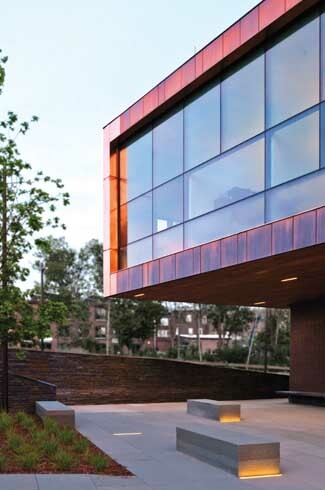 The façade is clad in locally-sourced stone, brick and copper. The definitive element of this project is its marriage of strident green credentials with a futuristic form. Greenfield has a reputation set in old business, which has spawned alleys full of broody buildings made of dark brick. 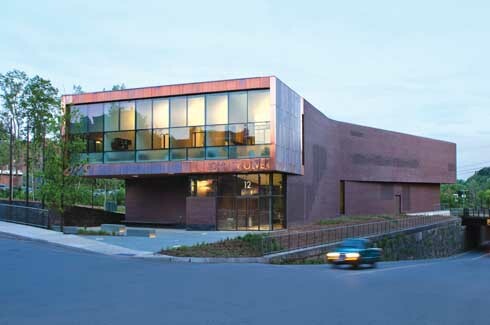 The John W. Olver Transit Center has been conjured up on similar lines, and it fits the need to pay homage to its site’s legacy and the demand to build something highly energy-efficient. The façade here has a weather-toughened look, and a sloping form that is interspersed with thin and broad strips of glass panels. “Our design bends the building toward the northern end, which gives the center a sense of motion, or perhaps a current running through the structure,” states the team. The western end is a wide swathe of dark brick, an effort at making the most of the afternoon sun. The energy creation and usage at the John W. Olver Transit Center is evened out by a photovoltaic array that stretches across a 7,300 sq. ft. area. There are 22 geothermal wells, each dug 400 ft. underground, functioning at the site. Also present are a boiler fired by wood pellets, and occupancy sensors peppered across the 24,000 sq. ft. building. Brick, bronze, copper, concrete, steel and stainless steel, walnut wood, plaster, bluestone, and elements of terrazzo went into the construction of the Center. The top floor of the Center is occupied by the offices of the Franklin Regional Transit Authority, and the Franklin Regional Council of Governments. 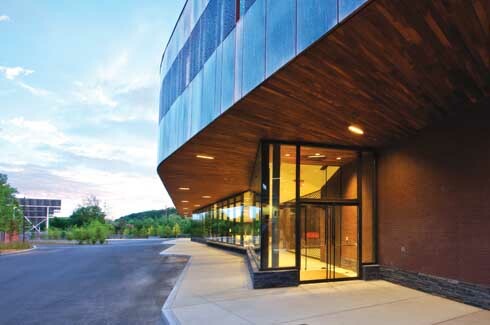 The facilities at the building include an indoor waiting area, a café, WiFi connectivity, rest rooms, an outdoor green stretch, and bicycle racks. The year 2015 should mark the start of Amtrak rail service here as well. The John W. Olver Transit Center is the first zero-net energy government transit hub in the United States of America. The John W. Olver Transit Center is dedicated to the Democratic Party representative from Massachusetts, John Walter Olver. It is not just a standalone example of energy efficient architecture, but is expected to initiate a revolutionary chain-reaction of carbon-neutral government buildings in the US. “Local officials are looking to the transit center to spark downtown revitalisation and sustainable development,” attests the design team. Indeed, the John W. Olver Transit Center sets a highly-efficient, simple and accessible precedent.